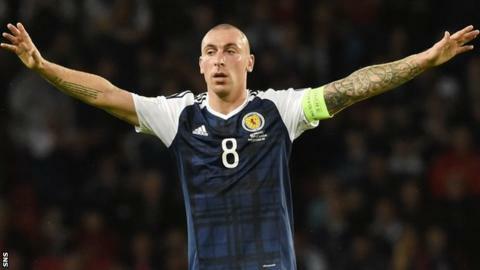 Celtic captain Scott Brown has blamed a packed football calendar as he retired from Scotland duty for a second time. The 32-year-old, who earned 55 caps, had initially ended his international career in August 2016. He overturned that decision two months later but has called it a day after talks with Alex McLeish, who has succeeded Gordon Strachan as team boss. "In terms of looking after my own body and in interests of my family, I felt now is the right time," he said. "I have spoken to Alex McLeish over the weekend. I really wanted to tell Alex first what I was thinking about things. "As I said to Alex, I felt that, given the demands which are increasing all the time in football and at this stage of my career, I wasn't able to give both my club and country my best and I needed to focus purely on Celtic at this time. "The football calendar is more and more demanding now." Dunfermline-born Brown started his career with Hibernian and made his Scotland debut almost two years before his 2007 transfer to Celtic. He went on to captain his country under Strachan and made his previous decision to retire because of concerns about his own fitness in previous seasons. Celtic manager Brendan Rodgers described Brown's international retirement as a "real, real sensible decision". "I think he means it this time," said Rodgers. "It is obviously great news for Celtic and sad for the Scottish team. Is this the new 'Broony'? "I think the last time he went back it was probably for Gordon, to help someone he was very close to. "But for him and his career going forward, he wants to prolong career at club level." And McLeish paid tribute to the midfielder, and praised his influence over the squad, particularly the younger players. "I would like to thank Scott for his dedication to his country throughout his career," McLeish said. "I have known Scott for a long time and know how difficult this decision has been for him. "Scott gave his all every time he represented his nation and his influence on the squad is immeasurable. He has been a shining example for the younger players in the squad and an influential figure in the dressing room." Brown returned following talks with the former Celtic manager ahead of Scotland's World Cup qualifier against England. However, his latest decision comes after the failure to reach this summer's finals in Russia and ahead of summer friendlies that have been criticised by club manager Rodgers because of potential demands on his players ahead of next season's Champions League qualifiers. "I have really enjoyed my time with Scotland and making over 50 caps is something which I will always be really proud of," Brown told Celtic's website. "It was a huge honour to pull on the Scotland jersey every time I was given the opportunity and to be able to captain my country is a privilege I will always cherish." Brown thanked the managers and players he has worked with in international football - and the fans for their backing. "I want to wish Alex and the squad the very best of success for the future and particularly for the upcoming campaign," he added. "Obviously I'll be supporting the lads all the way as they try to get to the Euros."